The score of this game is not a misprint. It was a 29-0 game played between two major-league championship teams. The two biggest reasons for the lopsided score were that the Atlantics made 30 errors and that they were facing one of the best pitchers of the time, Albert Spalding. It wasn't entirely poor play on the part of Brooklyn's regulars. 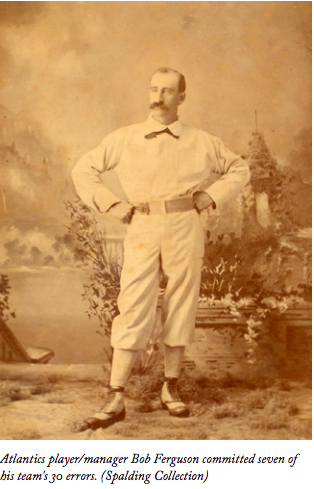 They had previously defeated the Red Stockings three times in Boston, 9-3, 6-2, and 9-8, the last of which came just the day before, with Bond bettering Spalding. The New York Clipper explained that the “Atlantics attribute the result to the fact that their regular catchers were both injured, and they had no one to catch.”3 Keep in mind that in those days, passed balls by catchers were considered errors. A play-by-play of this game has not seen the light of day. The Boston Globe said, “It would be impossible almost, to follow the game through its tedious course.”4 The Globe box score indicated that Boston received first base on errors 11 times. (Brooklyn had none.) The other 19 Atlantics errors perhaps allowed the Red Stockings to take an extra base, and possibly score. Boston hit eight doubles, quite a number given that the team is credited with only 121 for the season – a significant percentage of the season's total in just this one game. Tommy Bond, the Atlantics pitcher, did give up 26 hits, which means that with the 11 men who reached first due to error, 37 men got on. With only five men left on base the entire game and 29 scoring, three were put out on the bases. The box score does not mention any double plays. The Globe reported that the Red Stockings made seven fly catches, while the Atlantics made five.Was this game an anomaly for Bond? A comparison of key statistics for Bond and Spalding for 1874 shows this to be not entirely true. Bond's ERA suggests that his pitching was arguably quite good, but that he was let down by the defense, and that his teammates were not as prolific on offense as Spalding’s were, as shown by the significant difference between the runs scored. Boston scored early and often; the only inning in which they did not get a run was the fourth. If their 13-0 lead after six wasn’t enough, the Bostons scored 13 times in the seventh inning. Brooklyn made only four hits. One of them belonged to Charlie Snow, who after catcher Jake Knowdell broke his finger in the fifth inning, came into the game long enough to play center field and collect his one and only major-league at-bat. Facing the best pitcher of the day, he singled and thus retired from big-league baseball with a 1.000 batting average. Conversely, he had three chances in the field and fumbled all three, for a career .000 fielding average. Bond was a local amateur, a native of Lowell, who was welcomed into the game so the Atlantics could field nine. Bob Ferguson moved from third to behind the plate, but couldn't handle Bond's pitches. He finished the game with seven errors. Spalding, A.G., and Lewis Meacham. Spalding’s Official Baseball Guide for 1878 (Reprint). 1 Boston Post, October 2, 1874. The Boston Daily Advertiser and the Boston Globe both called it a wild pitch by Spalding, assigning him the error. The Globe also counted 36 errors, but lacking play-by-play, it is impossible to be fully certain how many there may have been. See also "An Extraordinary Event on the Ball Field. Defeat of the Atlantics by the Bostons by a Score of 29 to 0 – Heavy and Weak Batting, Splendid Fielding and Miserable Muffing," Boston Daily Advertiser, October 2, 1874. 2 "Another 'Comedy of Errors' – The Atlantics Whitewashed by Champions – Score 29 to 0,” Boston Globe, October 2, 1874. 3 New York Clipper, October 17, 1874. 4 Boston Globe, October 2, 1874. 6 Lord Dundreary is a character in the 1858 British play Our American Cousin by Tom Taylor. (It is the play Abraham Lincoln watched the night he was assassinated.) Dundreary is the personification of a good-natured, brainless aristocrat.